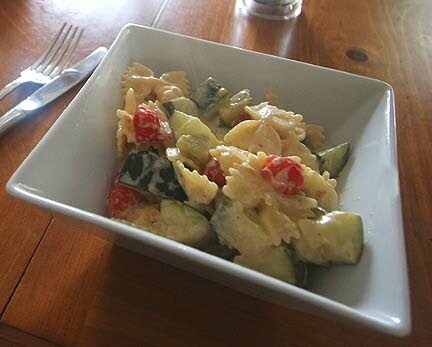 It was inspired by the creamy lemon pasta with chicken and sundried tomatoes that I used to order at a restaurant near my office. Quarter the squashes lengthwise, then slice 1/4″ thick. Halve the tomatoes. Cook and drain the pasta. Melt the butter in a frying pan. Add the onions and squash, sauté until the squash begins to soften. Add the garlic and sauté a few more minutes. Add the yogurt (or sour cream) and lower the heat. Add the parmesan, milk (or cream), lemon pepper, salt, lemon juice, zest, and tomatoes. Simmer until the sauce thickens. Pour it over the pasta. Toss gently to mix it, serve with freshly grated parmesan. This is just one version of the dish. I like to improvise, using whatever vegetables and pasta I’ve got on hand.